6 lenses per box @ $46.62 per box. Minimum order 2 boxes. 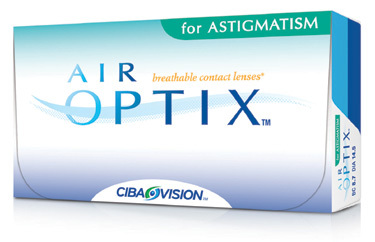 The Air Optix for Astigmatism alleviates any symptoms of dryness, discomfort or redness experienced by wearers of older toric lenses. Ciba's stabilization system gives better overall and more consistent clear vision for astigmatic lens wearers, with less worry of blurred vision caused by the lens shifting on the eye. In addition, Ciba's Aqua moisture system provides white, healthy looking eyes at the end of a long day, and without problems of dryness.